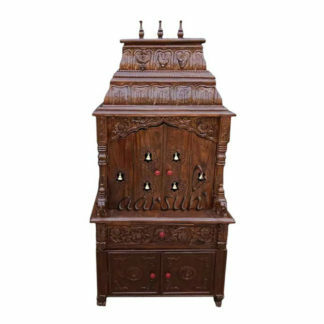 Get a Traditional and Devotional Feel to your home with Aarsun Woods Wooden Temple / Prayer Unit in Teak Wood. 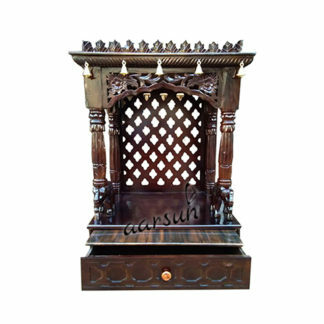 Aarsun Woods brings to you handmade Teak Wood Temple built by skilled craftsmen from Saharanpur, India. 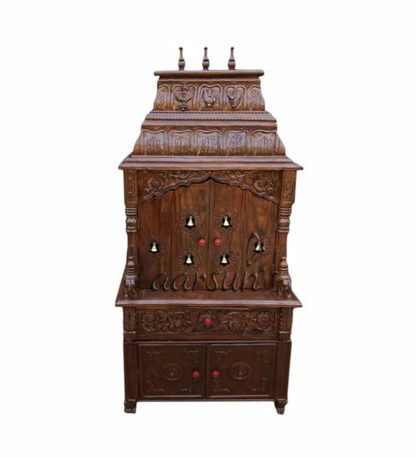 Saharanpur Handicrafts is famous all over the world for the intricate wood work and traditional finish. The artwork and the designs goes beck to the Mughal era and is influenced a lot by Mughal Architecture. Wooden Temple by Aarsun Woods always have a uniqueness even when the design is the same. As each unit is handmade, each Temple has its own Texture and shade. The Wooden temple shown above has a beautiful sructure carved out in Teak Wood commonly known as Sagwan or Sagaun Wood in some parts of India. The Whole temple looks fantastic and as it is made in Teak Wood which is Termite Resistant, is durable enough to withstand pretty harsh weather conditions and can last for years. The unit shown is polished in Dark Walnut finish. However, as we are the manufacturers, the Temple can be polished in Natural Wood Color as required. The size and the design can also slightly vary with your home decor. Contact us at +91-8192999135 / 8266888634 for details or for availability at your place. If you are looking for Sheesham Wood Temple , and for other designer Teak Wood Temple and Mango Wood Temple.